Have you been dreaming of how smooth it would be to have Excel connected to AdWords? There might be a reliable workaround solution for you. This article is for more advanced users but don’t be scared – why don’t you just become advanced user by trying all of this stuff? You don’t have to be a coder. I am not coder either. In today’s article, we will be combining AdWords Scripts, Google Big Query, Big Query ODBC drivers for Excel and Power Query in Excel to create an improvised Power Query AdWords Editor linked to AdWords via almost live connection. All the resources in this article are publicly available (including almost ready-to-go script), there is no need for special paid licenses, nothing like that. Previously, when you wanted to “connect Excel to AdWords”, you could be exporting all the AdWords data to Google Sheets via scripts or via SuperMetrics. Then you’d have this Google Sheet file connected to Excel via Power Query. This approach has several issues. First of all, Google Sheets can only hold 2,000,000 cells which sounds like a lot but it is not. Imagine you have 500,000 keywords with campaign + ad group name, keyword, match type and max CPC bid. 5 columns x 500,000 rows = 2,500,000 cells and you are done with that file. And you have not even added the ads. Or the extensions. Another issue I have been facing several times is that when exporting decent size account to Google Sheets via AdWords Scripts, the sheets would randomly break – they would stop simply accepting the new data and they would freeze after any change you make. I have reported this to Google here but as usual, nothing has been fixed or attempted to be fixed. When using SuperMetrics for exporting the data to sheets, I am occasionally seeing incomplete queries to be inserted into the Google Sheets but the Google Sheet file would never break unlike with AdWords Scripts. Example: You have 103,304 keywords in you account and but the query only pulls 35,000 keywords (the number is always a nice rounded one). So in summary, AdWords script tend to work until the Google Sheet file breaks and SuperMetrics don’t work reliably with large accounts. However, this is the only slight complaint about SuperMetrics, it’s otherwise great tool for day to day reporting. I think that only a minority of users run such heavy queries like I do and most of you would not face query timeouts. So do we get out of this vicious circle? 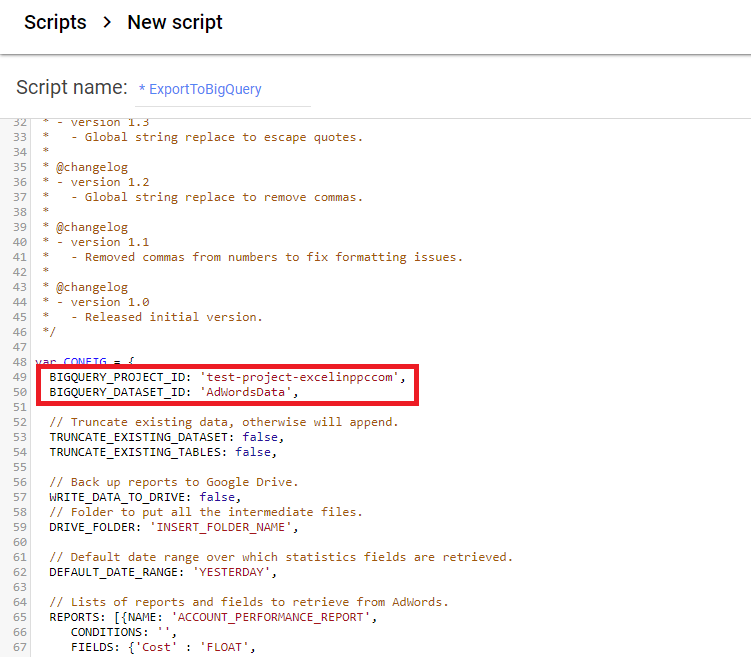 You send your AdWords data to Big Query with AdWords Scripts on hourly/daily basis. Big Query can reliably hold millions of rows. Once loaded to Power Query, you treat the data like if it came from a CSV file. The only difference is that you are connected to your “almost live” AdWords feed. So let’s take it step by step in more detail. First thing to mention is that Big Query which resides in the Google Cloud Platform is a paid service from certain level of usage. More details here. In short, I think that 99% of users will be fine with Free tier which includes 1 TB for querying plus 10 GB of storage per month. 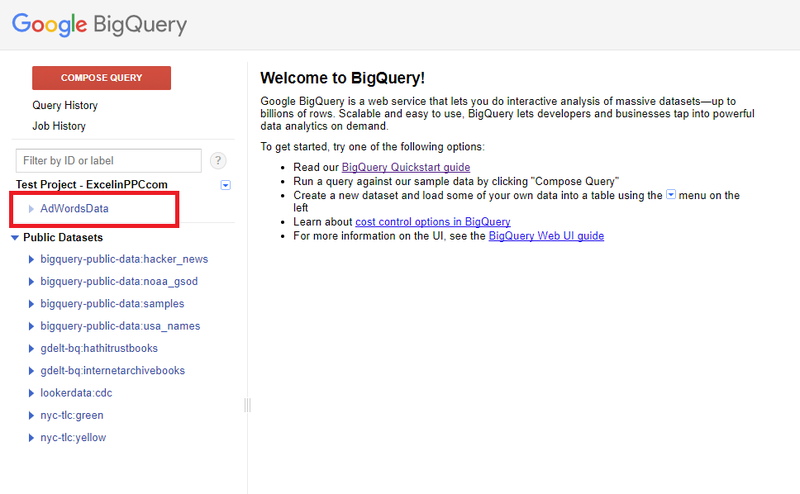 Uploading data to Big Query is for free. Alright, so how do you start? Go to https://cloud.google.com/ and sign up with your Google account. You may be asked for your credit card details – there is no way around it. You have to provide the details despite the fact you will not be paying anything at the end. 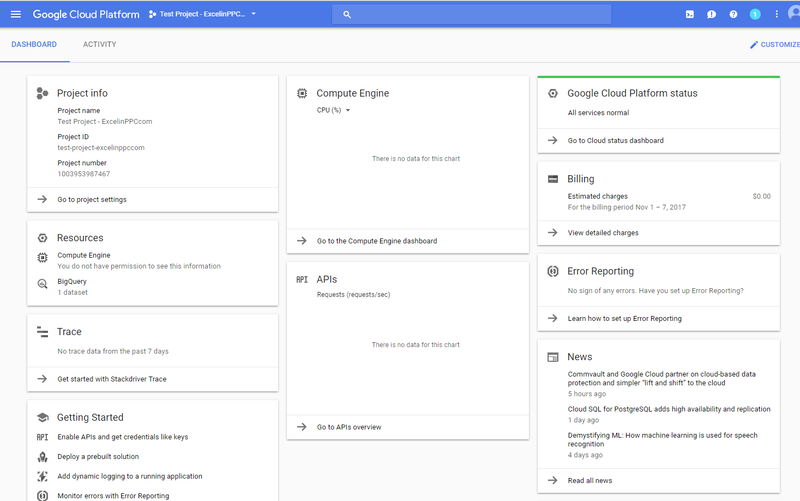 GCP Project = All the inter-connected GCP subproducts running in 1 group. Project has an ID. Big Query Dataset = collection of tables (we will have e. g. table of keyword performance or table of search terms). Dataset has an ID. Big Query Table = just of table of data. Table has an ID. Alright, that was not too difficult, was it? Now, it’s “ID” time. You need to find ID of your GCP project and ID of your Big Query dataset. Copy just one of them and go to AdWords. The default setting of the scripts downloads keyword performance, search terms and account performance for “YESTERDAY”. You can use some fancy name for the script. 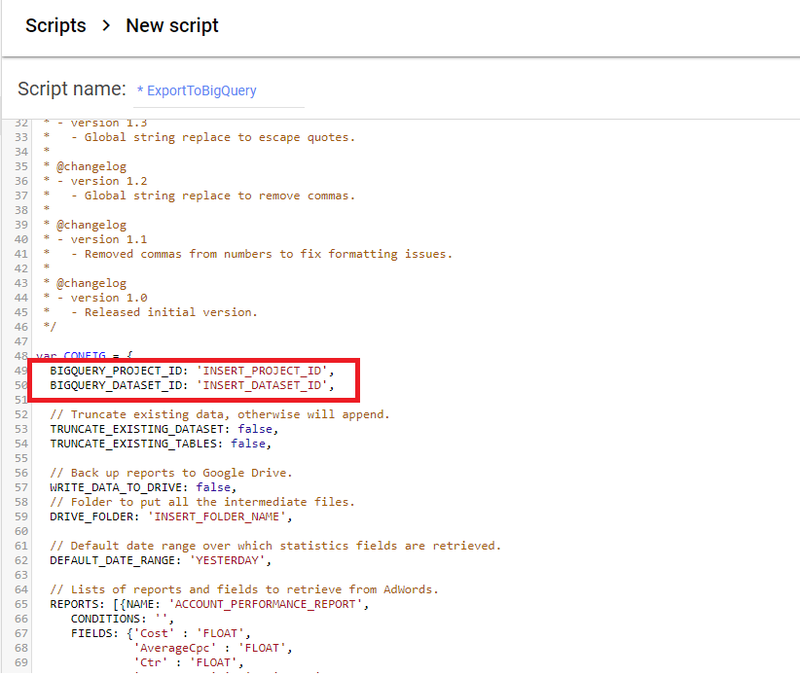 I am using just “ExportToBigQuery”. You can also setup your email on line 525 in order to get notifications when the script finishes successfully. 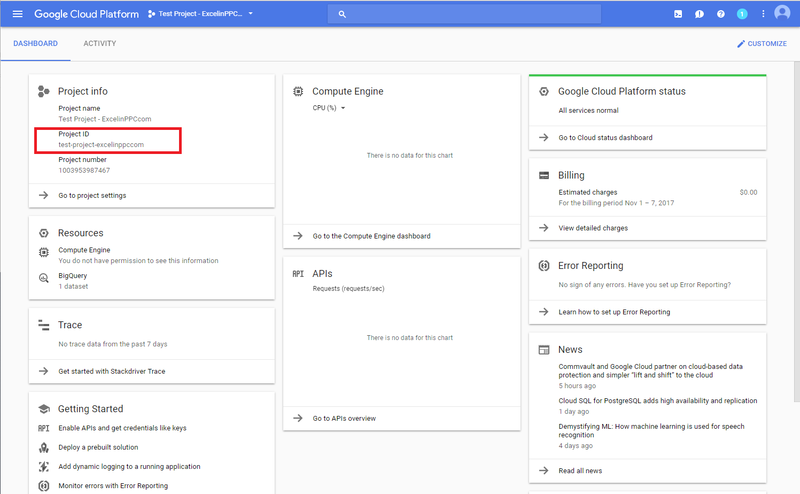 If you don’t setup the email, the script will always end with an error (the tables will still be sent to Big Query correctly). Et voilá, your tables (Account performance, Keyword performance, Search Query performance) are now in Big Query. Can you change the default reports in the script? Yes, you can. You need to adjust the script accordingly. It looks difficult at first sight but it is not that bad. Lines 64-100 in the single account script. Where can I learn more about AdWords scripts? E g. I want to know which time range values I can use. Well, good start is AdWords documentation here. These are all the reports you can store in Big Query relatively quickly. Another good source is https://ppc-scripts.eu/en/. Can you change the default time frame from “YESTERDAY” to something else? Yes, line 62 in the single account script. You use e.g. “LAST_30_DAYS”, “LAST_MONTH” etc. Again see the Adwords documents above to get your head around it or leave a comment at the end of the article. Is the data in Big Query overwritten every time the script runs? Depends on your setup, by default, it’s not and new data is only appended to already existing tables. If you set lines 53-54 to “true” the values will get wiped out and inserted as new. This is handy when you e.g. renamed all your campaigns and you want to have correct names in Big Query. What are the limits? In Big Query, the tables can hold millions of rows. I doubt, you will get even close to hitting the limit. In AdWords, the script can only run for 30 minutes. You will see how timing goes for your accounts and then you will adjust the amount of reports or date range accordingly. You can have multiple scripts running and pulling data into different datasets if you hit the limits. So now you are sending the data to Big Query on regular basis. Imagine you are sending all your keywords, ads, campaigns etc. to a dataset in Big Query every hour and you want to have your Excel connected to the last version of the “snapshots” in order to create your custom “Excel AdWords Editor”. During the process, you need to get your access token (then a refresh token – that one should refresh automatically), then choose the project to which you want the connection to be applied. Once done, click OK and close setup windows. Time to move to Excel, finally! What the SQL statement does is that it takes all the columns (the * trick) from ACCOUNT_PERFORMANCE_TABLE in AdWordsData dataset. The SQL statement can get more complicated than that but for our use case, it’s enough. You would proceed similarly with all the tables stored in Big Query, effectively creating your “Power Query AdWords Editor”, so 1 query would always load 1 table (e. g. keywords, ads, sitelinks and so on). And that’s it. You now have Excel connected to AdWords. 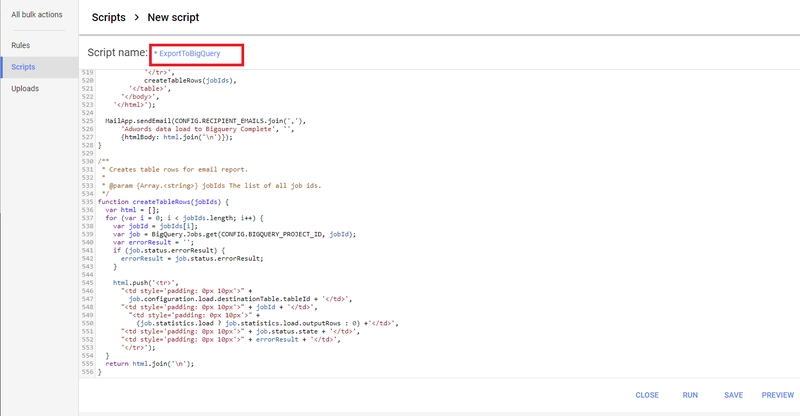 This tutorial demonstrated how to create an improvised Power Query AdWords Editor. …then you will basically have Power Query AdWords Editor which pulls (almost) the latest snapshot of your account. Obviously, you will not be able to upload anything back to AdWords from Power Query and you will need to upload the results of your queries somehow manually to AdWords, but still, Power Query has lots of advantages over the conventional AdWords Editor. Great post. Wondering if there is a script for Search Console. I’d love this exact same solution, but with Search Console data. Though, the setup in BQ is different… But still, does not look like rocket science to me. Thanks for the article. Very helpful, and exactly what we are needing to do. Can you confirm this is the best, or at least a still reliable, way of connecting Excel to Adwords? Also, does the SQL statement for Power Query need to be made once, or every time we want to update our data in Excel? Is this for desktop and cloud Excel? I’m wondering what would happen on the Excel end if we aren’t connected to the Internet. However, if the above mentioned articles looks too complicated to you (I can easily understand that) then this article is way to go. Just keep in mind that Google Ads scripts can run only for 30 minutes and if your account is massive, the script may not have enough time to sent everything to Big Query. This time out problem would be solved if you use “Google Ads Transfer Service” for sending the data to Big Query but again, there would be some SQL knowledge involved + $2/month cost for each account you are trying to pull. Once you setup your Excels with SQL queries set in Power Query to Big Query, you just keep pressing “Refresh” button whenever you need to pull fresh data into Power Query. Once you refresh you Excel tables from the cached Power Query data, you can go offline. If you try to refresh you Excel tables while being offline that will not obviously work.